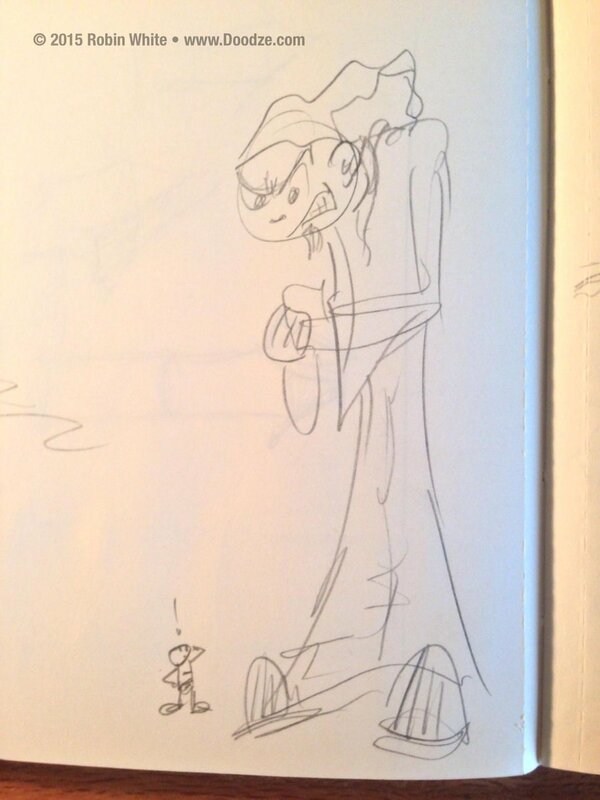 Here’s a random Doodze with a Gargamel-like evil wizard… Something that never happened in the comics… although I imagine that human beings will appear someday. 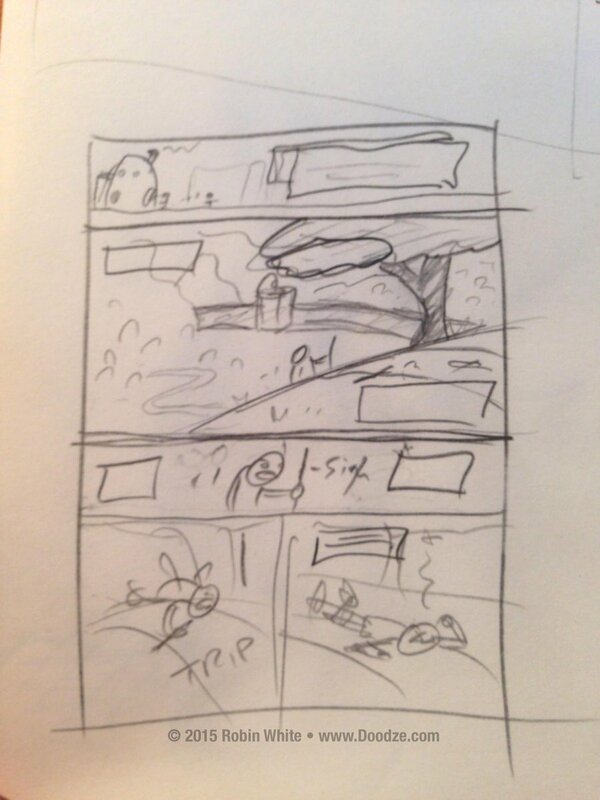 This is an early thumbnail sketch. At this point, as you can see, the houses are not bamboo-shoots, and I was probably still thinking that Doodzes would live in a human-less world. 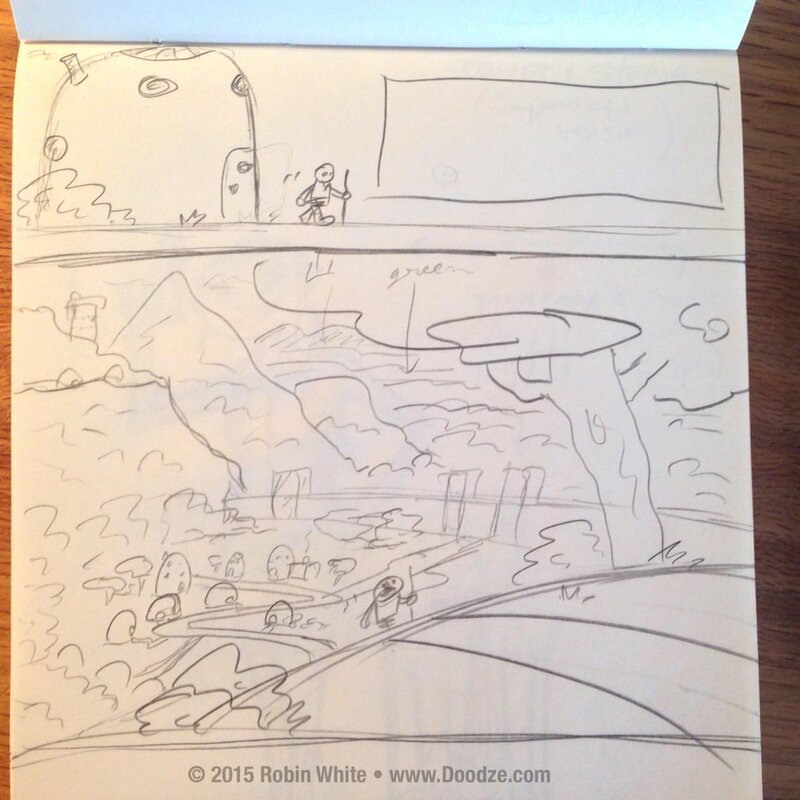 Here’s a slightly more refined pencil version of one of those thumbnail pages. Again, note the houses. 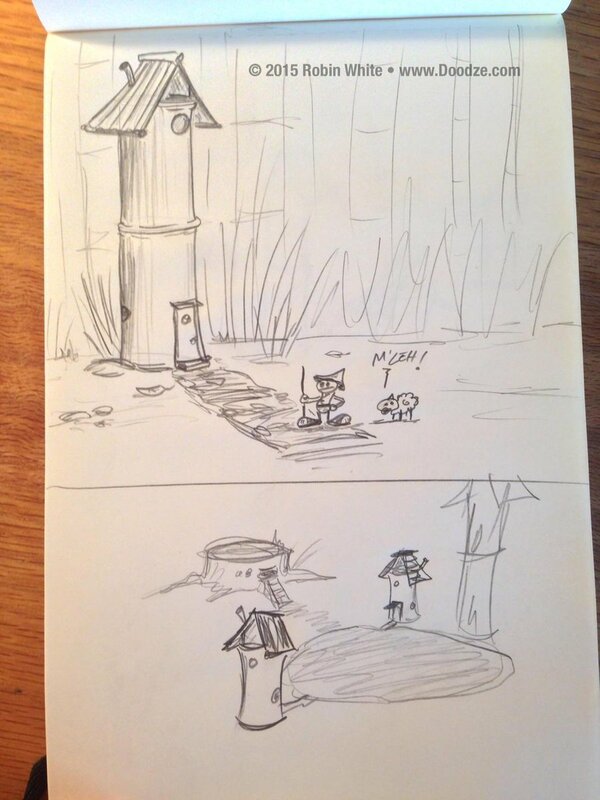 Early proto-Doodzes… though at this point they didn’t have a name or their own concept. I was actually in the middle of creating a totally different webcomic that never happened, and was coming up with various weird creatures for that story. Out of those doodles, Doodze was born. I’m pretty sure it was this drawing, or one like it, that made me decide to make the Doodzes into tiny Smurf-like people. I just loved the idea of them living in bamboo shoots. I drew this last week for our contest winner. He should be getting it, along with a signed copy of the Doodze book, soon, if it hasn’t arrived already. 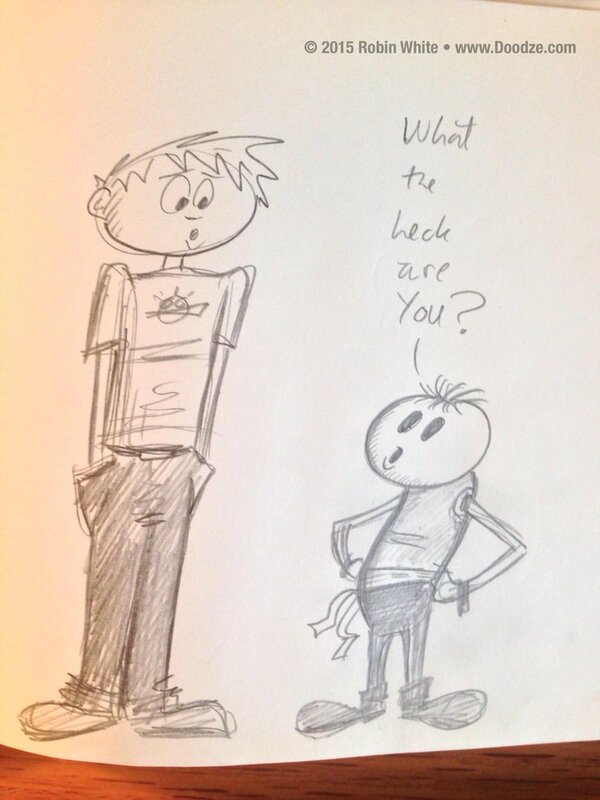 So what’s up with the NEW Doodze stuff, anyway? That, my friends, is a good question! 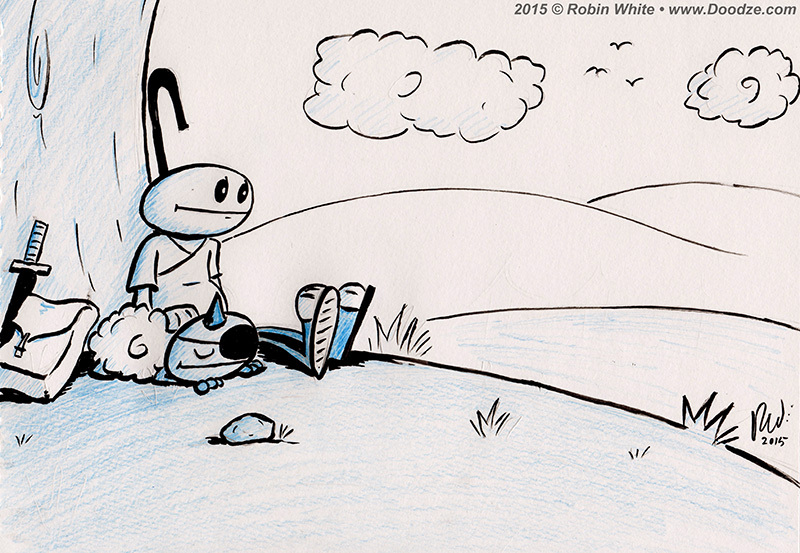 It’s been almost a year, I think, since Doodze book one finished serializing here on the site. And at several points I’ve blogged or tweeted that new stuff is in the works. I may have even been bold enough to say “Coming soon!” Well, if I was so bold, I apologize for now living up to those claims. The thing is, the first Doodze book suffered from too much improvisation, which resulted in a LOT of editing once it was supposedly done. I want to make sure I have the story worked out ahead of time this time… and it’s been taking longer to get there than I’d imagined. I’ve probably been guilty of over-thinking it to the point of taking the fun out of it. But I think I needed to put it down for a while so I could come back at it with a fresh perspective. Well, I think I’m actually close to knowing what I want to do now, and where the story is going next, and (the hardest part of all) what to do with the all-important first act. I learned a LOT through the process of making Doodze book one, and through various books, blogs, podcasts and so on that I’ve taken in over the past several years. Trying to APPLY what I’ve learned has taken some work. Meanwhile, I’ve also been playing around with some other, non-Doodze-related ideas. One or more of these may take priority over Doodze from time to time… BUT I do still intend to tell more stories with Doodze. I’ve come to love these characters, and want to get back to regularly putting out finished content. So… I’m not going to make any bold promises just yet. As you’re reading this, I’m away from home and not able get “down to business” just yet. But HOPEFULLY I can make an official announcement soon, and HOPEFULLY that’ll mean new Doodze. 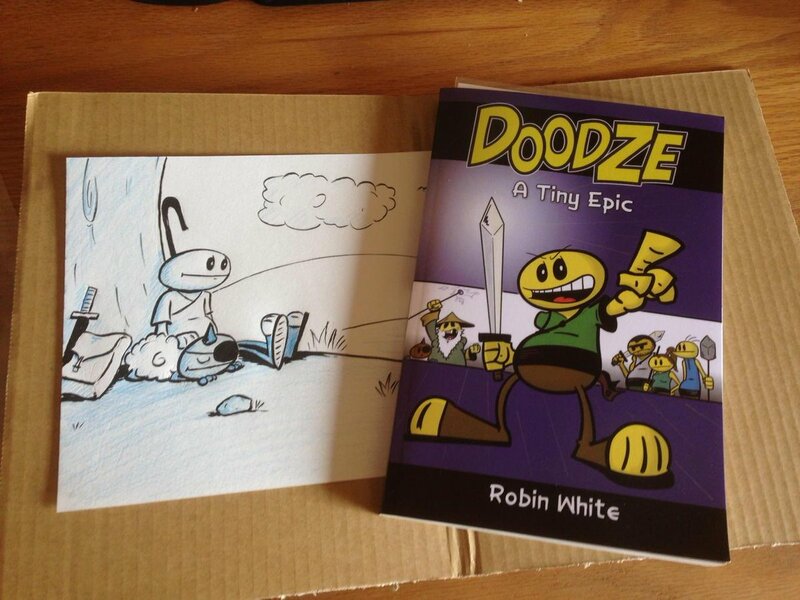 PLEASE: If you’re a fan of Doodze, could you share a link to the site or the book? And if you’ve bought a copy yourself, why not upload a pic and link here? If you let me know where it’s posted, I’d love to see and share it. 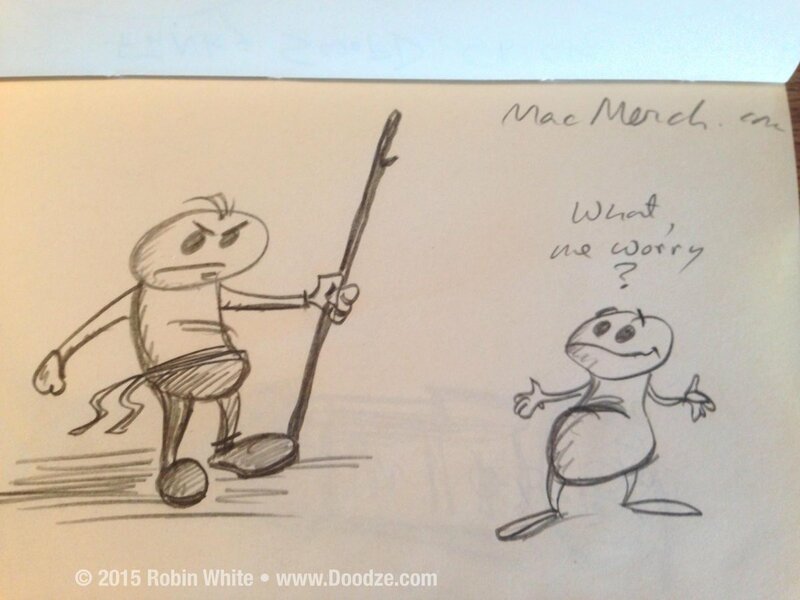 And, if you don’t want to miss out on the latest Doodze (and other me-related) news, please subscribe to this blog or follow me on Twitter (Doodze and Me) or Facebook. THANK YOU so much for reading! Hope you’ve had a great summer.